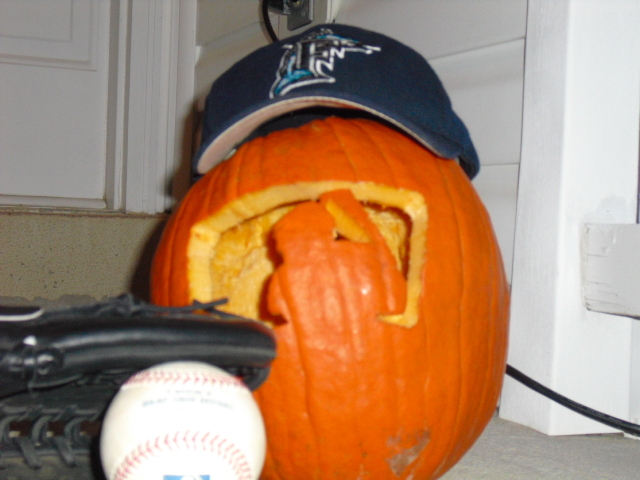 Spontaneously, I suggested to myself to carve the “MLB” logo into a pumpkin. I’ve never had any sort of artistic talent, but I was able to craft this in half an hour. Half an hour, from a whole, stuffed, pumpkin to carved with the MLB logo. Unfortunately, I made a blatant mistake–I cut the cap bill off the Harmon Killebrew silhouette. Other than that, I was very pleased with the final product. As I may have preciously mentioned, I love the Marlins’ teal-black-silver color scheme for their logo and uniforms. According to a few blogs and forums I have read, Marlins president David Samson announced recently that teal will not be a main color in their new scheme (starting 2012). That completely shattered my hopes of the Fish having the best uniforms in baseball next year, but I guess I’ll just have to adjust to whatever they put on the table. The Marlins will officially unveil their new logo and uniforms on November 11th, and at that time the team will officially become the Miami Marlins. Pretty slick! Well done. I did an Angels logo pumpkin for this first time this season. It definitley made the offseason arriving before November a little more palatable. Great! 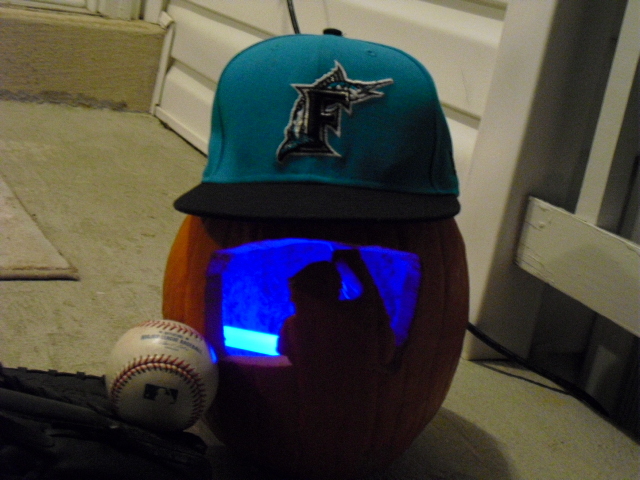 This was the first baseball pumpkin I’ve ever done. Maybe next year I’ll go for the Marlins logo, as long as the new one is interesting! Previous Pujols to stay in St. Louis?